Owning an Alfa Romeo is a rite of passage if you’re hoping to gain credence in the world of car enthusiasm. It’s an unwritten rule, passed down through the generations, revolving around the belief that because Alfas are legendary for their beauty, idiosyncrasies and unreliability, if you’ve been the custodian of one, you must be made of the right stuff. The less glamorous alternative is to grow a beard, sport a flat cap and find a moss-cultivating old MG roadster. Modern Alfas are models which can be used everyday but are beyond the mere mainstream; rather than going the premium route they pursue the autostrada towards sportiness and passion. Their cuore sportivo advertising slogan said it all. I’ve been there, albeit briefly, with the Milanese marque’s last flagship saloon, the 166. Unusual styling, a throaty 3.0-litre V6 and a morning guessing game of guess which warning light will appear first on morning start-ups are my abiding memories. Unfortunately, larger Alfas are notoriously slow sellers and an illustrious motorsport history alone cannot shift metal out of the showrooms quickly enough. For a brand that must achieve growing sales volumes to justify its future existence, it needs to operate in the lower reaches of the marketplace, at least in terms of size if not price. Despite resurrecting the old Giulietta nameplate, Alfa’s latest mid-sized family hatchback traces its lineage back to the 1970s Alfasud via the 147, 146 and 33. Is it more than just a Fiat Bravo in a prettier dress? From almost every angle the Alfa Romeo Giulietta looks sensational. Is it as good in the metal? Whilst looks are always subjective, it’s a fruitless challenge to find a car that looks more special and exquisitely detailed in a market dominated by Astras, Focuses and Golfs. You’d be very hard pressed to decipher the hard points it shares with the Fiat Bravo too, despite much of the hardware being common, albeit significantly modified for an experience to bring cheer to the hearts of the Alfisti. Where to begin? Sensuous curves grace every panel from the immediately recognisable shield-shaped grille, all the way rearwards, suggesting a skin pulled tautly over a muscular structure, rather than stamped steel pressings. Outboard of the grille are two vertically stacked multi-lensed headlamps, the inside edges of which glow brightly with a quartet of LED day running lights, adding a new dimension to Alfa’s down the road graphics as one approaches you in the distance. Naturally, the offset number plate remains a feature of the nose. Side panels reach a waving crescendo just below the window line where a variable depth crease wafts in and out of the metalwork to accentuate the haunches over the wheels. Silver finished pull handles on the front doors and a lack of side rubbing strips keep the body clutter free to amplify the Giulietta’s elegance. Continuing the trend Alfa introduced on the 156 saloon in the late 1990s, the rear door handles are built into the trailing edge of the window line, suggesting this is a sportier 3-door car, yet all Giuliettas are more practical 5-doors. At the rear, the minimalism continues: the Alfa roundel sits centrally, just above a classic script bearing the Giulietta name, both of which are flanked by an elongated pair of LED-laden rear lights. At any price, these must be amongst the most distinctive and beautiful tail lights on any current car, spiralling dots of red light from the circular ends inwards along a strip to the centre. Wonderful attention to detail and a feature you find yourself trying to catch a glimpse of as you stop-start past the plate glass windows of city centre shops. This Veloce specification model would have 17” Turbine alloys as standard but these have been upgraded for a fresh take on Alfa’s hallmark teledials, with the circles of the finger slots appearing to go beyond the edge of the rim itself. Sporty intent confirmed and reinforced with additional Veloce cues like the satin finished door mirrors, side skirt extensions and dark headlamp housings. Many will feel the Giulietta looks perfect but I just can’t love the nose as much as I do the rest of the car. If the emphasis of the headlamps was more horizontal than vertical, mirroring the tail lights, the Alfa would appear wider and more aggressive. Maybe the stylists will try something new come the mid-life facelift. 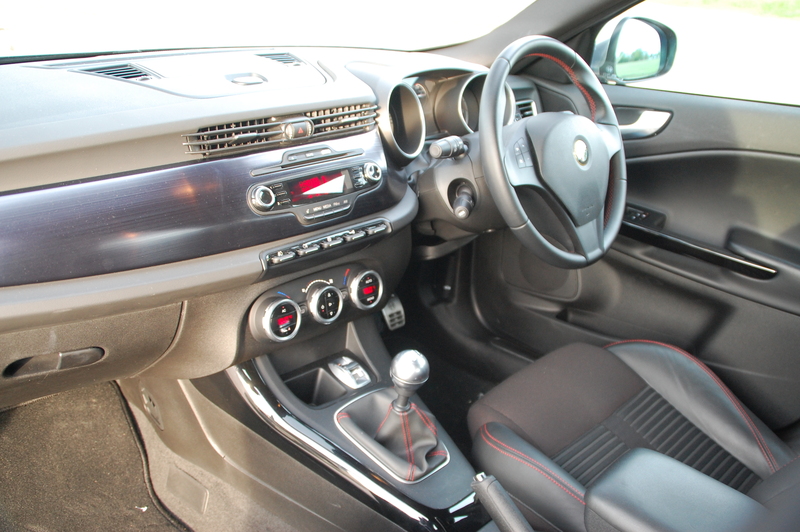 Has Alfa injected as much Cuore Sportivo into the Giulietta’s interior? 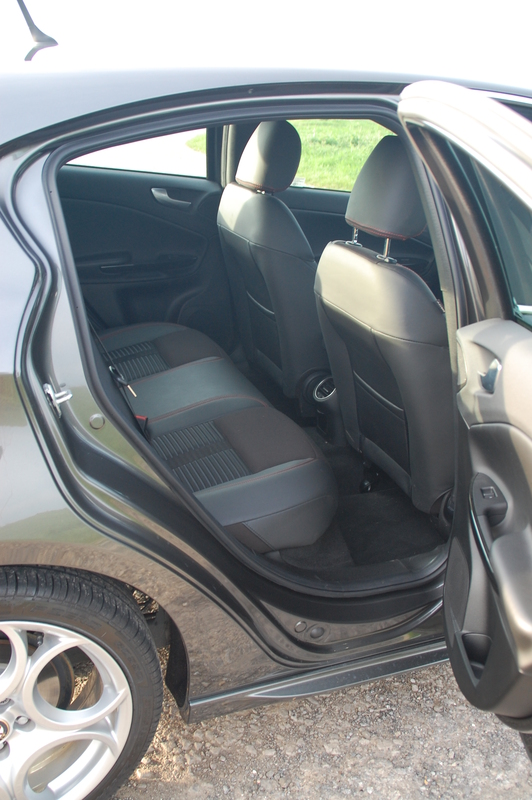 Open the driver’s door to the Giulietta’s cabin and it seems the recent Alfa Romeo conundrum continues. The dilemma appears to be whether to go for style or outright quality and for whatever reason, Alfa seems truly unable to combine the two. However, there are reasons to rejoice as in the Giulietta, the margin between the two is much reduced over models of old. Gone are eyeball air vents and dramatically twin-cowled instruments of Alfa interiors of old, replaced by a modern interpretation of what constitutes as sporty in a family hatchback in the 2010s. Although the dashboard doesn’t wrap directly around the instruments any longer, the speedometer and rev counter are dished dials with bold graphics sat deep within a pair of circular pods; the two minor dials and multi-function display nestle between them. Stretching the cabin’s width is a chunky, thick plastic moulding with a large, dark fillet of cold, striated metal. Such is the design that it looks integral to the dash’s structure rather than an adornment, with a pleasingly solid look to the arrangement. The stereo controls are set within the centre of the plinth with minor switchgear set into the plastic mouldings below, including a quintet of rubberised U-shaped toggles which prove satisfying to operate. Get yourself comfortable in the fabulous part-leather seats and let your fingers caress the steering wheel. Whilst the airbag boss isn’t the most visually attractive, being flat and lacking relief, the rim itself is a delight to hold. Silken soft leather, with bright red stitching, envelopes an ergonomically-shaped wheel that feels tailored specifically for the driver’s palms. Holding it at a 10 to 2 position feels natural and a position that can be maintained much of the time due to the Giulietta’s sharp gearing on the steering rack. 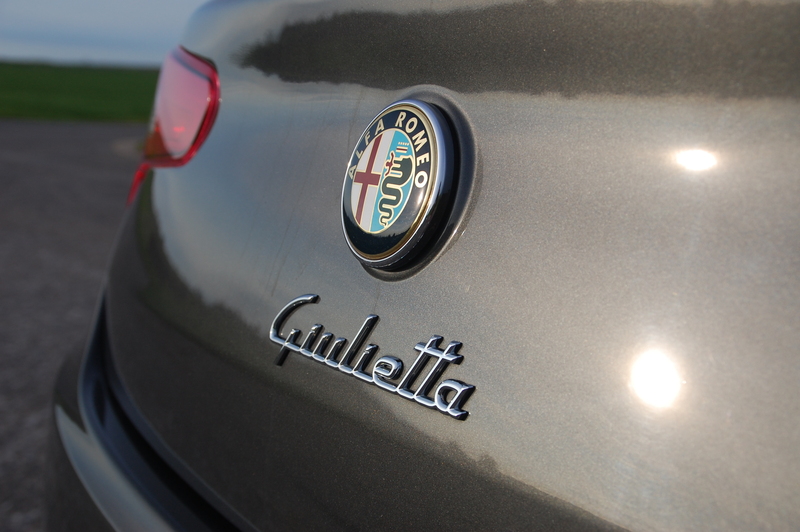 Let your hands explore further around the Giulietta’s interior and the story is a little less rosy. Whilst the majority of plastics feel tough and robust, the moulding over the steering column top suggested fragility, moving relatively freely when the wands are operated. The stubby gear lever is precise in its actuation too, complementing the steering and giving the impression of making rapid progress and maximising the Alfa’s potential. Disappointing then that the silver ball which forms the gear knob is nothing more special than a plastic moulding. If real metal can be used for the dashboard decoration, then why not here where you hands are in almost constant contact? Failing that, more of that soft leather would be welcome. Should you venture into the rear of the Giulietta’s cabin, you’ll find it comfortable for two adults, three at a slight push, although the Alfa lacks the out and out capaciousness of its mainstream rivals, sacrificing a little function for a more glorious form. In Veloce specification the interior has a series of additional features to reinforce the sporty message: dark headlining, aluminium pedals and sports seats, with leather outer panels and a central filling of deeply ribbed fabric helping keep you firmly in place. 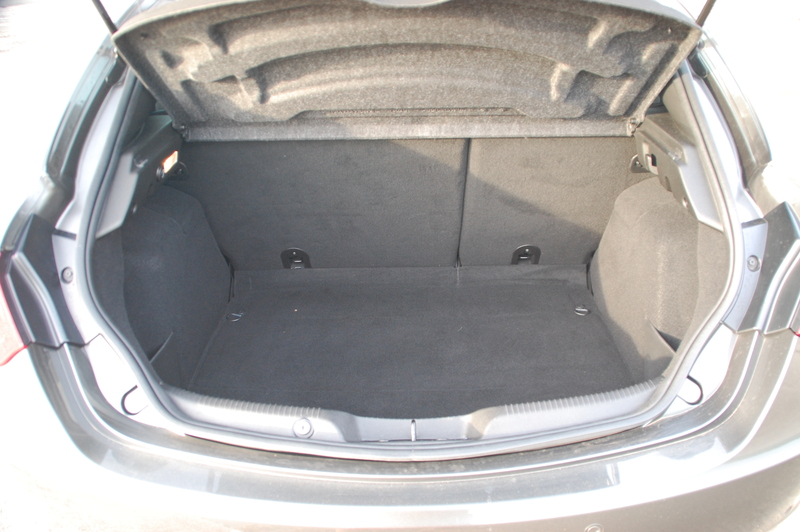 Even the Giulietta’s boot is pretty… Okay, it’s not, but this is how big it is. Pop the tailgate to access the boot and you’re greeted with a sensibly sized and shaped 350 litres of volume. As you’d expect, the rear bench split folds in order to increase flexibility. Again, many rivals offer a more cavernous cargo bay but they do so with much less style on the outside. The Giulietta clearly hints at a sporty experience – does it meet with expectations? When a car has a distinctive set of qualities, they call it character. Well, the Alfisti amongst you be pleased to hear the Giulietta has character by the bucket load. Gripping that sensual steering wheel is the first point of contact with the joy that the Alfa can deliver. The steering action itself is quick but also provides a wealth of rich feel to the driver, fully communicating whatever the front wheels are up to. The initial sensation is that it’s a little too heavily weighted but the more you drive the Giulietta the more sense it makes; it’s light enough around town to make it easy to manoeuvre in car parks, yet loads up satisfyingly and progressively as the pace increases. 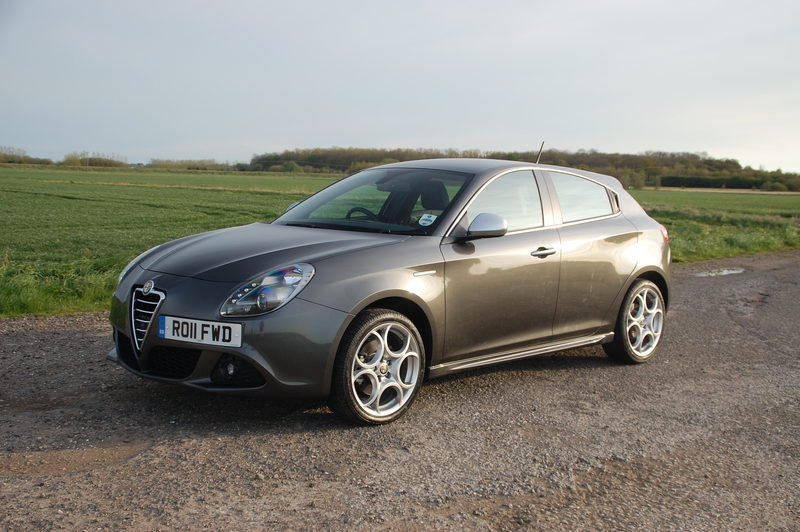 Alfa Giulietta – fine handling and a refined ride quality too. Cake? Eaten. 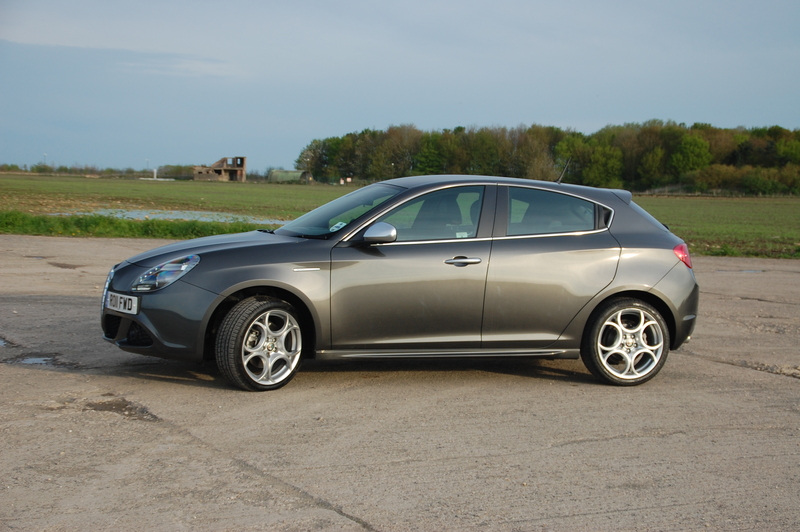 Usefully, the Giuletta’s handles charmingly too, the chassis’ responses working in unison with the steering inputs. It seems the Alfa was designed to be at its best harrying along winding countryside roads, gripping tenaciously through corners and with poise and balance. Because you are so aware of what the steering’s up to, understeer remains a distant foe: point the car where you want it to go, manipulate the speed accordingly on entry and power out the exit, the rear wheels loyally following the direction of the fronts. 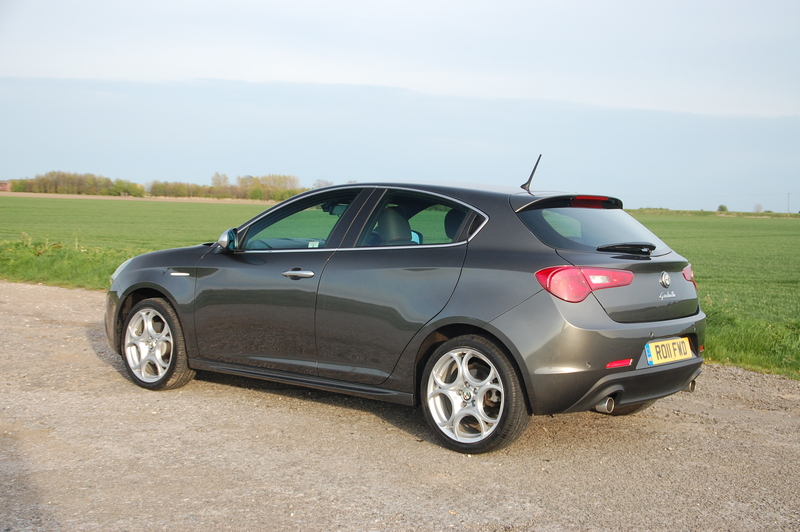 In spite of the fitment of those delicious 18” alloys, low profile rubber and sports suspension on the Veloce model, ride quality is surprisingly good, both at low and high speeds, transmitting little of the unevenness of the road surface to the Giulietta’s occupants. There is no ride or handling compromise with the Alfa, both are accomplished. However short or long your journey, you exit the car with a smile on your face. That’s character. Does the Giulietta’s drivetrain allow you to maximise the enjoyment? 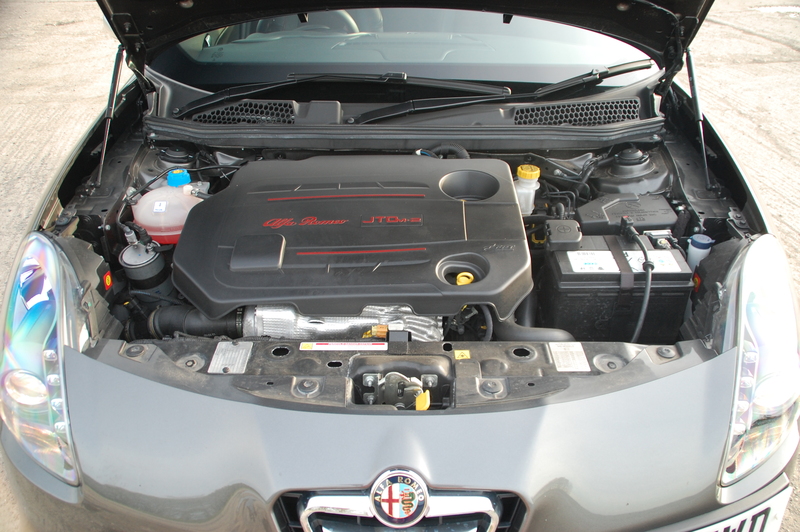 Fitted to the test Giulietta was the 140bhp version of the Fiat Group’s second generation 2.0-litre common rail diesel engine – a 170bhp of the same unit is also available in a wide range of petrol and diesel powerplants. For a car that has such a capable chassis and easily accessible handling fun, the performance of the JTDm engine is best described as brisk and does leave you wanting more urge transmitted through the Alfa’s front wheels. Reaching 60mph in 9 seconds is hardly a poor showing but such is the Giulietta experience you’d be best scraping together more pennies and opt for a more powerful engine. If this mid-spec diesel is anything to go by, the range topping 235bhp Cloverleaf must be a peach. Diesels continue to grow in popularity despite the cost at the pump, because of the mid-range surge of thrust such engines deliver, as well as fuel economy benefits. The former is in very rude presence, providing healthy doses of go, whatever the selected gear ratio. Close by the gear lever is Alfa’s DNA control switch, offering different engine mapping settings to maximise performance or economy. In ‘Dynamic’ mode, the Giulietta comes alive, offering a snorty exhaust note as the performance increases – slightly frustrating that whenever you turn the engine off, it defaults back to ‘Normal’ and you have to go through the rigmarole of switching modes again. In ‘Dynamic’ mode fuel efficiency takes a bit of a battering, hovering around the low 40s in mpg terms, a significant drop from the heady claims of the 62.8mpg official claim. Pootling around more sedately (yes, it’s just about possible to take leave of your senses and pootle in the Alfa) pushes the figure closer to a more realistic 50mpg. It won’t come as a surprise to learn that the Giulietta is equipped with a stop-start function but what will surprise and disappoint, is that it’s the least successful application of the technology I’ve yet sampled. Everything’s fine as the speed is discarded, the engine cutting out at a complete standstill when the gear lever’s knocked back into neutral; the rev counter pointing to 0rpm and the little amber display confirming stop-start is in operation. Other cars’ systems cut in almost imperceptibly when the clutch is depressed, meaning by the time you’ve nipped into first gear it’s all systems go and you’re off. Not so in the Giulietta. Dip your left foot and the engine clatters back into life with an agricultural sound track. It’s not instantaneous either, apparently still cranking over as I tried to pull away on a couple of occasions. It simply isn’t as slick as it should be and prevents effortless getaways. As well as boosting economy, these systems shouldn’t detract from the driving experience. Whereas in other cars you’d restart the system on an amber light and go on green, in the Giulietta you’re trying to second guess when the amber will show so that you can set off with the rest of the traffic. 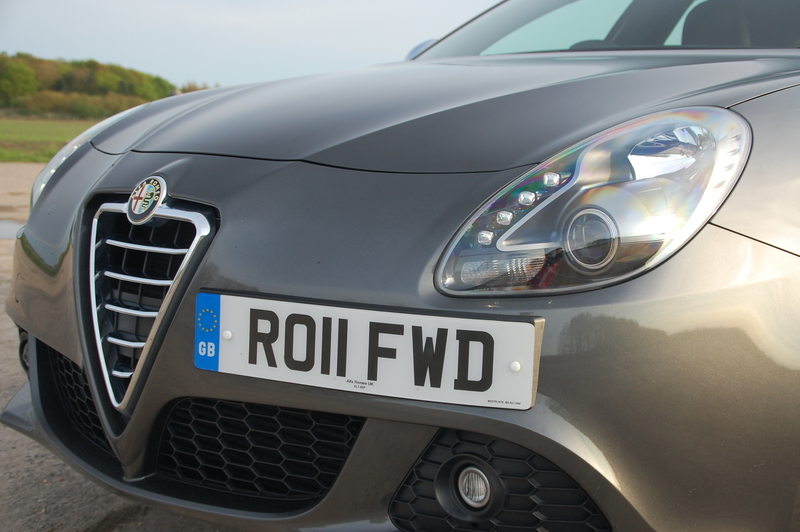 Stop-start grumbles and detractions aside, the Alfa Romeo Giulietta is nevertheless an intriguing and engaging contender in the highly competitive C-segment and against the likes of the Focus and Golf it has its work cut out. What the mainstream challengers can’t compete with is the sheer beauty of the Alfa, a car that generates knowing nods and admiring glances from other drivers, a hatchback filled with handling brio that genuinely engages the driver without leaving passengers to suffer a rubbishy rattling ride. Choose a Giulietta and you know every time you get back out again you’ll be counting down the time until you need to get back in and experience its charms once more. Buying an Alfa Romeo family hatchback is no longer a difficult compromise. Yes, it’s still got its idiosyncrasies and whilst one hopes reliability issues are consigned to history books only time will confirm this for sure. But it is an Alfa and it is beautiful. Do you need any other reasons? Thumbs Up: Fabulous looks, engaging driving experience, superb handling, lovely steering wheel. Thumbs Down: Obtrusive stop-start system, some flimsy trim, no Bluetooth audio compatibility. 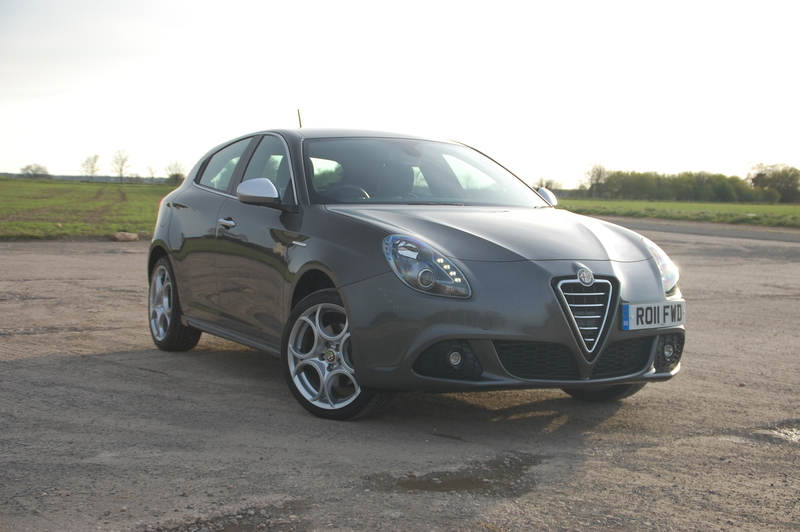 Alfa Romeo Giulietta starts at £17,755 for the 1.4 TB Turismo, with the 1750 TBi Cloverleaf topping the range at £25,510.